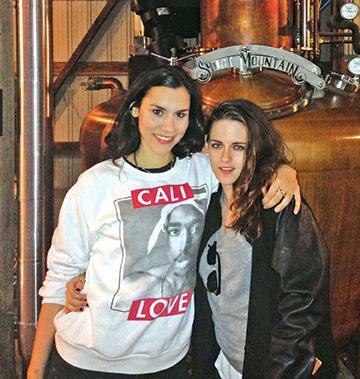 Sage Galesi strikes a pose with Kristen Stewart. Back on a cold afternoon in February, Short Mountain Distillery had some serious VIP visitors. Kristen Stewart, star of the Twilight series of movies, made her directorial debut creating a video for friend Sage Galesi of Sage + the Saints, a Nashville country band, on the farm where the distillery is located in Cannon County. sums to artists to tell stories in different formats. Rapper Macklemore and producer Ryan Lewis recently used some of these funds to release a short docuseries about their life on tour. Soon they found themselves away from the LA glamour and out in the muddy foothills of the distillery’s farm with the sheep and warming themselves by hanging around the still. “Take Me to the South” will be released in about two weeks. It will be available “everywhere” according to Galesi. The song will be part of an independently produced cd available for pre-order at http://www.pledgemusic.com/projects/sageandthesaints. back hills brew, go to www.shortmountaindistillery.com.